On Thursday, March 15th, 2018, Linden Lab CEO met with a group of invited participant for the Above the Book events at VWBPE 2018. Lasting some 80 minutes, the conversational Q&A session was livestreamed for its first hour to the main auditorium at the conference. Also in attendance at the event was Brett Atwood (Brett Linden), Senior Manager for Marketing at Linden Lab, was also in attendance. The transcript notes don’t follow the chronological flow of the session, as I’ve attempted to group subjects by topic for more concise reference. Audio of responses to questions are provided for each section of the transcript. Questions are given in bold. Comments from Ebbe Altberg are prefixed EA; comments from Brett Atwood are prefixed BA. The video of the session is embedded at the end of this piece for reference and for those who would prefer to watch it. My thanks to the VWBPE stream team for providing it. For those who prefer,the following is a bullet-point list of the core questions asked, gathered into the same topic headings as the transcript notes. Links are given to the relevant part of the full transcript for those who would prefer to read / listen to the complete answers / comments. Education is, and remains, an important element of the lab’s thinking, both with Second Life and with Sansar. Jump to topic. For educators interested in engaging with the Lab, the best way to do so is by reaching out to Brett Linden, who himself is an educator with 15 years experience (and who currently teaches a course as Washington State University) and who sees himself as a advocate for virtual worlds in education. There is also the SLED distribution list and the education community forum through which educators can discuss idea and (with the SLED list) reach LL. There is also the SLED wiki page to help educators. To help educators promote their endeavours, Brett suggests looking at SL Place Pages as a means to self-curate a web presence for in-world activities. Jump to topic. The Lab is willing to work with educators on putting together documents / information addressing the value proposition, safety, security, etc., of using virtual space in education which can be used by educators to help inform their administrators and IT experts. Jump to topic. The Lab is also willing to consider ways to make SL more attractive to the education market, preferably with a list of prioritised ideas from the education community, which can be compared with other requests for features / improvements, evaluated (technically and in terms of value / ROI, etc). Jump to topic. It’s unlikely that LL will, in the near future, provide a dedicated resource to the educational / non-profile community. However, the recent re-alignment of the Second Life and Sansar team structures means there is now a dedicated SL marketing resource, lead by Brett, to help and support SL communities such as the educational / non-profit community. Jump to topic. What has been the educational uptake with Sansar? Relatively low profile, but the potential is there as demonstrated by the likes of the Voyage Live: Egypt experiences and the LOOT Interactive NASA Apollo Museum experience. Sansar is too early in its development to offer much in the way of ease-of-access for the disabled. The Lab would like to hear of specific instances where more could be done to help with accessing Second Life by those with disabilities. What is the Lab’s position on speech-to-text, text-to-speech? There are 3rd party tool already available, which the Lab might not look to directly integrate into their platforms. However, major players like Microsoft, Google and apple are developing capabilities which the Lab might look towards integrating in the future. Providing a plug-in architecture for SL / Sansar to allow third-party extensions (text-to-speech, etc. ), has been suggested. Not n the current roadmap, as SL client already provides a lot of open-source extensibility. Possibly something TPVs could implement / contribute. For some services, would have an associated cost involved, adding complexity, simply because third-parties charge for their services. More broadly, Sansar has offered accessibility for people to be able to create and publish their own VR experience to the world without the need to develop their own platforms on which to run them. Jump to topic. Will Sansar have easier access to content tools? Jump to topic. The Second Life team numbers just under 100 people (engineering, support, operations, customer services, and not including finance, compliance, etc.). Jump to topic. Key focuses for SL are: enhancing the platform, growing the user base and trying to re-balance the economic model away from a reliance on land fees. Costs of involvement in Second Life remain a concern for the Lab, which is taking a high-level look at trying to pivot revenues away from the land model potentially towards more of a transaction-based model, while at the same time trying to reduce at least some of the burden of land costs (e.g. the 2016 private region buy-down offer and more recently, the Mainland price restructuring). In time it is hoped that transitioning revenue away from land might lead to a further reduction in land costs to educators. Jump to topic. Other areas of focus include making SL more scalable, secure and performant. Jump to topic. The Lab will soon be publishing a roadmap announcement of improvements / enhancements to Second Life. Jump to topic. Linden Lab has more clearly split the Sansar and Second Life teams; there are no longer people “floating” between the two and working on both. The Lab see a lot of overlap between the two products, with customers potential using both for different purposes. However, each has its own potential markets / its own selling points for those markets, allowing them to co-exist. The Lab believes that with 15 years of SL notwithstanding, the potential of virtual spaces has only been scratched, and both second Life and Sansar can do so much more. Huge engineering effort, still in early stages, which will take “all of this year and then some” just to get transitioned and working. Reduced capital investment and maintenance costs. Potential to dynamically scale consumption, rather than having simulator servers always on. Potentially more flexibility in products and tiers, possibly defined by a mix of region use and use-case (e.g. high-powered, high capacity servers for popular events; more moderate, lower-cost servers for residential use). Might add the ability to geographically locate simulators closer to dedicated audiences (e.g. regions serving South American communities could have their simulators running out of cloud locations in South America, reducing issues like latency for customers). Not something that will happen immediately, as the Lab will need to transition services and then refine operations and investigate option. VR remains a challenge to implement in Second Life due to the high run-time frame rates required. As such, it is not something the Lab plans to pursue or re-deploy. Streaming Second Life to a browser / mobile devices has been tried by third-parties (OnLive with SL Go and Bright Canopy from FRAME). It’s not something the Lab is actively pursuing at present, so they are leaving it to third parties. As the cost of cloud-base GPU technologies come down it might be something the Lab re-examines in the future. Note some !after stream” questions and comments are also addressed in the sections above. Will the Lab bring back the Teen Grid as “the Education Grid”? Not at this time, as it doesn’t fit with current plans to move away from dedicated infrastructure and to the cloud. Might be something to be considered after the move to the cloud: presenting grids for unique audiences. Can educators be given more control over their regions? This would need indication from educators as to what is required (prioritised list again). The 2018 Virtual Worlds Best Practice in Education (VWBPE) conference takes place between Thursday, March 15th and Saturday March 17th, 2018 inclusive. A grass-roots community event focusing on education in immersive virtual environments, VWBPE attracts 2200-3500 educational professionals from around the world each year. I recently gave a brief overview of this year’s conference at the end of February, so this piece is intended to provide a little more meat for potential visitors. As with recent years, the conference is focused on the 8 core VWBPE regions in Second Life, centred on the VWBPE Gateway. The best way to keep abreast of the full schedule is via the VWBPE 2018 event calendar. By default, this displayed in posterboard (shown below), but can easily be switched to agenda, month or stream views via the drop-down menu in the top right corner. Individual events can also be added to a number of personal calendars – Google, Outlook, Apple – making it even easier for attendees to track the events and activities they particularly want to attend at this year’s conference. Note: event details pages in the calendar include a “Where” item with an apparent SLurl. These links tend to open a further copy of the event details page, rather than provide a SLurl map page. Instead, and where provided, use the “location” SLurl at the bottom of event pages for direct access to the location via a SLurl map page OR note the location name and use the event Teleport HUD in-world – see below for more. 08:00-09:00: Opening Ceremony at the VWBPE Gateway. 09:30-10:30: Keynote – Dr. Mark Childs, TEL Designer, Open University, UK: Identity, literacy, immersion and presence; joining together the building blocks of virtual world learning at the Main Auditorium. 13:00-14:00: Livestream – Ebbe Altberg, CEO Linden Lab: a livestream of the Above the Book Conversation event with Ebbe Altberg, at which questions from an invited group of educators and individuals will be put to him. Livestreamed at the Main Auditorium. 11:30-12:00 noon Social Sim Opening Parade: Meet at the Lighthouse near Gateway and ride a seahorse in the parade over to the social sim. 12:00 noon – 13:00: Dancing under the sea at the Octopus’ Garden. 06:00-07:00: Morning Meet and Greet: meet VWBPE staff and volunteers, have your questions about events and the schedule answered and meet other attendees at the Social Area. 11:00 – 12:00 noon: keynote: Bryan Alexander, Education Futurist: VRevolution calls for a new digital literacy at the Main Auditorium. 12:00 noon – 13:00: Live Music with Keeba Tammas and her backup band, “The Tiny Maniacs” at the Social Area. 14:00-14:50: Under the Sea Adventure: explore the beautiful underwater area of the social sim and become a mermaid or merman. Under the Social Area. 07:00-08:00: Morning Meet and Greet: meet VWBPE staff and volunteers, have your questions about events and the schedule answered and meet other attendees at the Social Area. 08:00-09:00: Blending VWs & Digital Tech. in Language Teaching: teaching immersive English literature by blending 3D worlds, machinima and other external digital tools. At Lecture Area A. 12:00 noon – 13:00: Liberate Agency Amplification Via Avatar Identity: at Lecture Area B. 16:00-17:00: Waiting for the VR Evolution: for many who have embraced change and have been early adopters, waiting for the rest of the world to catch up has not been easy. A discussion at the Quadrivium. 18:00-19:00: VWBPE 2018 Closing Ceremony at the Main Auditorium. 13:00-14:00: Games and Fun on the Social Plaza. 17:00-18:00: Live Music with Nina Bing at the Main Auditorium. 19:00-21:30: Music and Dancing featuring Lightning Production’s U2 Tribute Concert. In honour of St Patrick’s Day (19:00-20:00) followed by DJ Coz Okelly 20:00-21:30). All at the Social Area. VWBPE takes place across 8 regions (including the exhibitors spaces). While exploring on foot is fun, the quickest way to get to event / activity venues is via the VWBPE Teleport HUD, which can be obtained from the vendors at the VWBPE Gateway. Simply ADD the HUD to your screen and click it when needed to open a dialogue box listing the key locations in the VWBPE regions. Click on the location you require to open the World Map with the location marked. Click on Teleport on the World Map to TP to the location. Simples! The VWBPE Teleport HUD – click the HUD to display a dialogue box of destination in the VWBPE 2018 regions (appear top right of your screen). Click the desired destination to display it on the World Map, then click the Map’s teleport button to go to the location. VWBPE is a global grass-roots community event focusing on education in immersive virtual environments which attracts over 2,000 educational professionals from around the world each year, who participate in 150-200 on-line presentations including theoretical research, application of best practices, virtual world tours, hands-on workshops, discussion panels, machinima presentations, and poster exhibits. 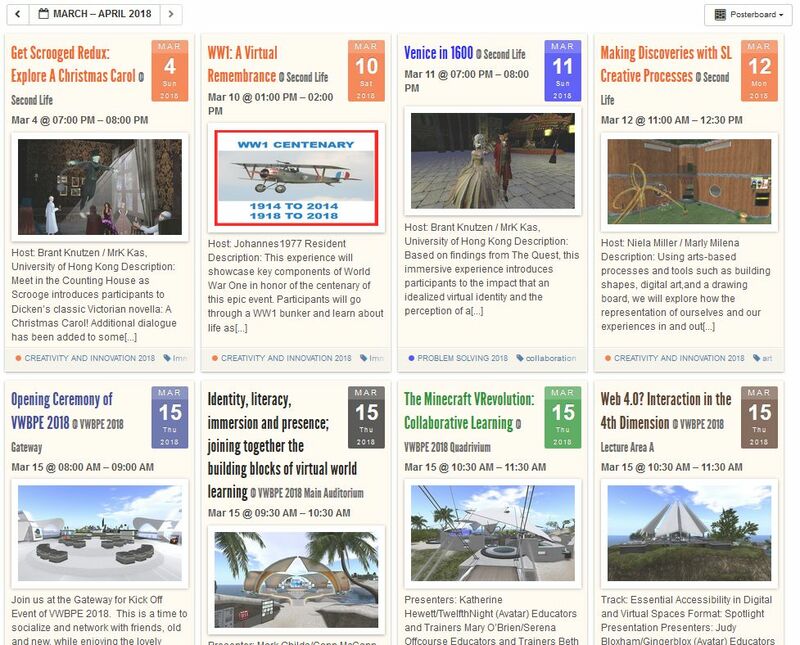 The 2018 Virtual Worlds Best Practice in Education (VWBPE) conference will be taking place between Thursday, March 15th and Saturday March 17th, 2018 inclusive. 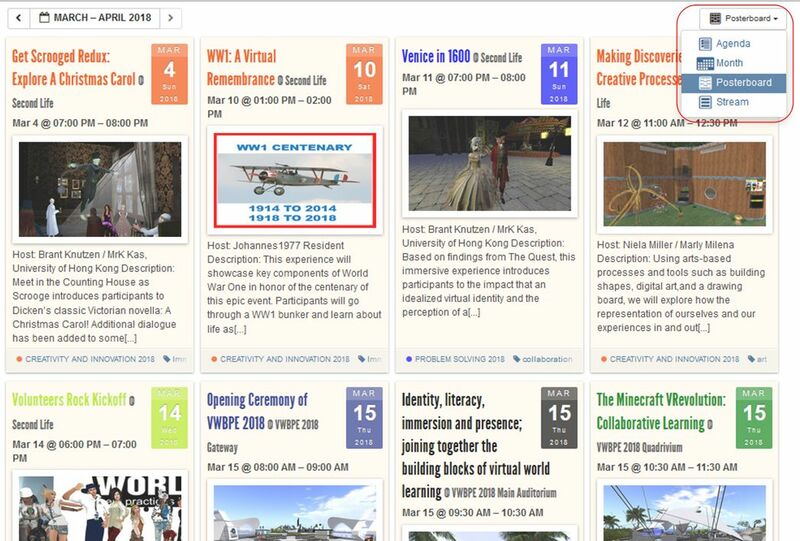 A grass-roots community event focusing on education in immersive virtual environments, VWBPE attracts 2200-3500 educational professionals from around the world each year. VWBPE is an ecosystem of digital spaces. While the conference is hosted in Second Life, our conference features a variety of virtual and digital spaces. 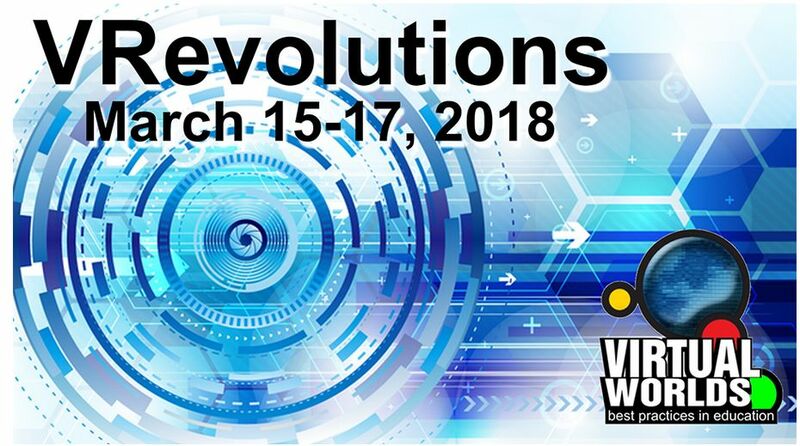 To present at VRevolutions, think outside the virtual space and consider how multiple available technologies and devices redefine what it means to work, create, and learn “virtually”. The VRevolution is about doing what scares you, what excites you, breaking and creating new paradigms. At VRevolutions, VWBPE welcomes the multifaceted communities that contribute to and expand best practices in digital and virtual spaces to support practice, creation, and learning. Regardless of the community you represent, your proposal should consider how it contributes and expands the knowledge base for innovative and revolutionary change through the increasingly complex landscape of digital technology. The 2018 event calendar has now been published, outlining the full range of events, both at the conference itself and in the days leading up to it / following it. Displayed in posterboard format by default (shown below), the calendar view can be switched easily to agenda, month or stream via drop-down selection Individual events can also easily be added to a number of personal calendars – Google, Outlook, Apple, depending on personal preference – making it even easier for attendees to track the events and activities they particularly want to attend at this year’s conference. As with recent years, the conference will be primarily focus on the 8 core VWBPE regions in Second Life, although a number of related social events will also be taking place elsewhere – sett the VWBPE calendar for the specifics on individual event locations / URLs. Dr. Mark Childs, TEL Designer, Open University, UK: his PhD was awarded in 2010 for his thesis Learners’ Experience of Presence in Virtual Worlds. Mark was the manager of the Theatron3 project from 2007 to 2009 which developed 20 ancient theatres in Second Life for performance and learning and has co-written and co-edited four books on learning in virtual worlds. He will be presenting Identity, literacy, immersion and presence; joining together the building blocks of virtual world learning on the morning of Thursday, March 15th, 2018. Bryan Alexander, Education Futurist: a prolific speaker and consultant, Bryan publishes books, chapters, and articles. He created the Future of Education Observatory, including the monthly FTTE trends analysis, an on-line book club, and a weekly video-conference discussion. He has been teaching and exploring virtual worlds since the early 1990s. He will be presenting The VRevolution calls for a new digital literacy on the morning of Friday, March 16th, 2018. The Above the Book guest for 2018 will be Linden Lab CEO Ebbe Altberg. Those wishing to attend the event must complete and submit the Above the Book application form, no later than Sunday, March 4th, 2018. There are still some volunteer slots left. If you would life to help run this year’s VWBPE, please consider hopping over to the volunteer sign-up page and completing the form there. The 11th annual Virtual Worlds Best Practice in Education (VWBPE) conference was recently announced, together with a call for proposals, which combines calls for presentation proposals, proposals for exhibits, and proposals for and immersive experiences (pre- and post-conference virtual experiences). The conference will take place between Thursday, March 15th and Saturday March 17th, 2018 inclusive. Those formulating proposals for submission should keep these ideals in mind in writing their proposal. All proposals for presentations should be made in one of the seven presentation tracks: Analytic Thinking and Complex Problem Solving; Creativity and Innovation in Design, Practice, and Learning; Essential Accessibility in Digital and Virtual Spaces; Collaboration and Distance Connections; Multimedia Communication and Multifaceted Interactions; Ethics, Responsibility, and Tolerance and VWBPE Redux. In addition, proposals for presentations should meet one of the three conference presentations formats: Spotlight Presentations (1 hour); Hands on Technology Workshops (90 minutes) or Compass Points Roundtable Discussions (1 hour). Full details on the seven tracks and three formats can be found on the VWBPE Call for Proposals page, together with general information on presentations and a link to the proposal submissions page. Note that the closing date for presentation proposals is Monday, January 8th, 2018. Exhibit proposals are open to those who wish to showcase their creative works in virtual worlds through artistic expression in order to promote their organisation or achievements. All exhibit proposals are reviewed by the VWBPE, and must apply to an already developed product for showcasing. Exhibit proposals should be made in one of the eight exhibit tracks: K-12 Best Practices; Higher Education/College Best Practices; Field Practices; Games and Simulations; Tools and Products; Advocacy; Support and Help Communities and Artists, Designers and Builders. Note that the closing date for presentation proposals is Thursday, February 1st, 2018. The Immersive Experiences category showcases locations whose main objective is interaction, immersion, and engagement for those who enter them, whether to play a game, solve an immersive problem, or engage participants in hands-on, interactive learning. All proposals for immersive experiences should be made in one of the seven presentation tracks: Analytic Thinking and Complex Problem Solving; Creativity and Innovation in Design, Practice, and Learning; Essential Accessibility in Digital and Virtual Spaces; Collaboration and Distance Connections; Multimedia Communication and Multifaceted Interactions; Ethics, Responsibility, and Tolerance and VWBPE Redux. In addition, proposals for immersive experiences should meet one of the two conference experience formats: Wanna Play? and Virtual Worlds. Full details on the tracks and formats can be found on the VWBPE Call for Proposals page, together with general information on presentations and a link to the proposal submissions page. Note that the closing date for exhibit proposals is Monday, January 8th, 2018.